The Arlington Park Racetrack experienced a major fire in 1985 that destroyed most of the main grandstand and clubhouse building. A new building was designed and constructed in 1989, and the ad agency was hired to produce new map and floor plan handouts for racetrack patrons to use in navigating the campus. 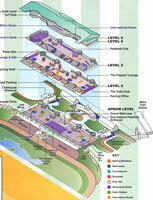 Randal Birkey was contracted by Dimeo, Rosen & Partners to produce an “exploded view” diagram of the new grandstand building, showing what was on each floor and locating major exits, restrooms, etc. Randal worked from technical architectural blueprint scale drawings to create an isometric diagram in Adobe Illustrator. 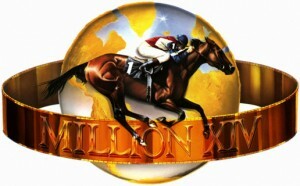 Randal also recreated and cleaned up the Arlington Million race logo in Adobe Photoshop for the same ad agency. Contact Randal Birkey for all your cutaway and exploded view architectural illustration needs.